Well, now that we know that the San Francisco 49ers will be playing the Baltimore Ravens in the Super Bowl, I think it is time to focus on what I consider the most important part of the day…the food! I made these little biscuit cups for my kids’ lunch last weekend, and they liked them so well we made another batch the next day. I think they would be perfect on your Super Bowl table. 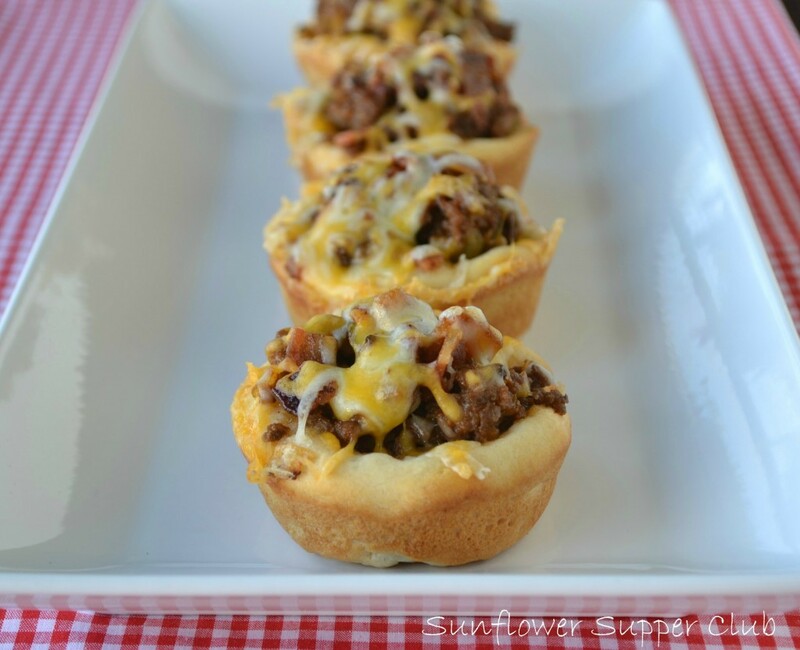 They have beef, bacon and cheese…what’s not to love? Brown the ground beef with the onion, garlic, salt & pepper. Drain. Add the barbecue sauce, Worcestershire, pickle relish, and yellow mustard. Continue cooking for another 5 minutes to allow flavors to blend. Remove from heat and stir in the ¼ cup of cheese. Flatten each biscuit into a 4-5 inch circle and press into a greased regular sized muffin pan. Fill each biscuit with about 1½ tablespoons of the beef mixture. Remove from the oven and top each biscuit cup with some of the bacon and the additional cheese. Return to the oven and continue baking for 2-3 more minutes or until cheese is melted and biscuits are golden brown. I prefer to use the regular sized biscuits for this recipe. The "Grands" is too much bread. Also, the bacon can be mixed into the beef mixture with the cheese before you fill the biscuits. I prefer to sprinkle it on top with the cheese, it stays crisper that way. I fully agree, I love everything in this recipe! How delicious! Thanks for stopping by Manila Spoon and so glad to have been acquainted with you! Now a new fan here, too. Thanks so much Abby! I feel the same way! Thanks Jennifer! I’ll be sure to check it out. Love these! I’ve made something similar to this with sloppy joe sauce. So good! Made with sloppy joe sauce sounds really yummy!